During the hard years of World War II, the lives of high school students across America were turned upside down and many were forced to adjust to a different lifestyle. 94 year old Jerry Mioshi was a senior in high school when her family was informed that they had to abandon their jobs, home, and friends and relocate to Tule Lake Japanese Internment Camp. Mioshi grew up in Sacramento, California throughout her childhood and continues to reside in the Meadows Senior Home, across the street from Kennedy High School. Before the years of World War II hit, Mioshi and her family lived out in the country on a fruit farm. She reminisced about her days on the farm in the warm sun picking fruit out the window of her family’s truck. Mioshi remembered that the hardest days after being interned were returning to their previous lives. They lost their job on the farm and had to attempt to make a living opening a new restaurant. 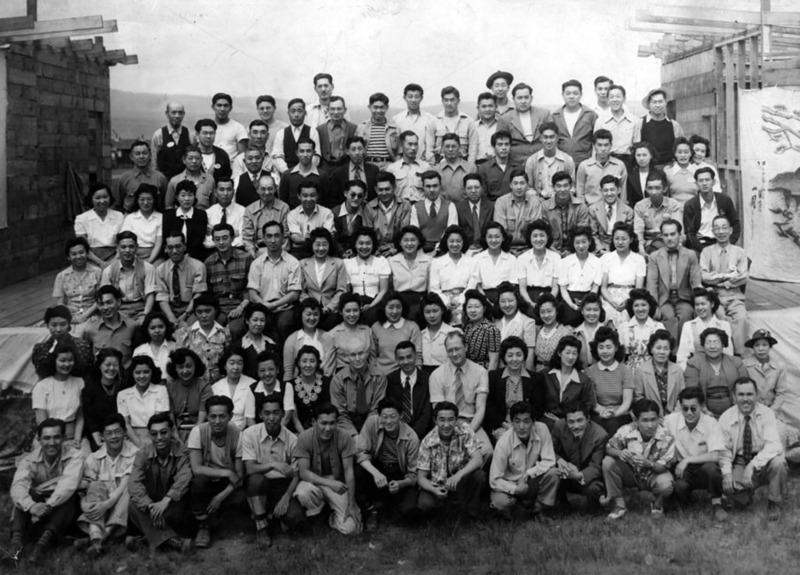 Group photo taken at Tule Lake Internment Camp during WWII. While Mioshi was interned at Tule Lake she felt the responsibility to take care of her siblings as she was the oldest and her parents were worried about what would happen to their family. Although they were free to roam within the camp throughout the day, they were restricted back to their rooms by 5:00pm. She continued her studies within the camp and was able to finish high school. Although there were continuous moments of worry and confusion for the family’s situation at the camp, Mioshi kept a positive mindset about her situation and managed to stay strong for her siblings. There were good moments on the camp, despite the fear of what was to come. She remembered, “We were scared, but my siblings and I were still young; we weren’t really serious. We would still laugh and play like we used to before they took us to the camps.” Mioshi went dancing every week with the dance instructor on the camp and soon she became the only girl he would dance with. She and her husband got married right before she turned 20 and her husband found a job at Campbell Soup. Surprisingly, Mioshi does not feel angry about being interned at the camps. She and her family learned to accept the situation they were placed in and made the best of it. Hard work is not something Mioshi falls short in; she worked hard and graduated high school, despite being interned and leaving the school she grew up in, and a few years she proudly described that she received her first job working for the state. The hard worker currently continues to read and exercise on a daily basis as she feels it is extremely important to keep one’s mind and body as healthy as they can be. Her positive strength is an inspiration to high schoolers today. As the students of Kennedy High School contemplate their futures, Jerry Mioshi is a reminder to be grateful for the equal educational opportunities that Americans receive today. Mioshi wants to encourage all high schoolers to continue to study and work hard through the struggles one faces because it leads to success in the long run. What Juniors Should Know for Senior Year?